Ian Davison and Theodore Faull, Earthmoves Ltd.
Mexico’s oil industry is opening up to the private sector after a 76-year state monopoly, and eyes are now focused on one of the world’s most promising continental margins. The oil boom of the early 2000s is now a distant memory as well-established oil fields such as the Cantarell complex and Golden Lane trend are in a rapid decline, and oil production in Mexico has fallen to its lowest level in 24 years at 2.44 MMbopd. January 2015, with data packages made available from January 2015. Bids must be submitted by the end of April and bid results are expected in September 2015. Mexico, Courtesy of Earthmoves The highlights of the round are the 11 deepwater blocks in the offshore Burgos Basin and Perdido Fold Belt, where a succession of important oil discoveries have been made in both the USA and Mexico. Pemex have made five major finds in the last two years, each with 100 to 500 MMbo in place (Trion, Supremus, Maximino, Vespa and Exploratus). In the US sector, five wells are expected to come online in 2016 producing 100,000 bopd and 200 MMcfg/d from Paleogene Wilcox Formation reservoirs on the Great White Field. These sandstones are also well developed in the Mexican sector, and deformed in a gravity fold belt which developed after the basin floor fans and channels were deposited. Hence, the reservoirs are draped over the fold crests, leading to a very high exploration success rate. The onshore and shallow water Tampico-Misantla and Chicontepec basins, which host the Golden Lane string of discoveries on the Tuxpan carbonate platform, contain over 110 Bb STOIIP. Five blocks are available in the Mexican Ridges Fold Belt, which extends down from the deepwater Burgos to the Veracruz Basin. To the south, a massive salt basin stretches 800 km from the southeastern basins to the northern reaches of the Campeche. The Campeche Basin has numerous oil slicks emanating from the crests of shallow salt structures, indicating a widespread active petroleum system. 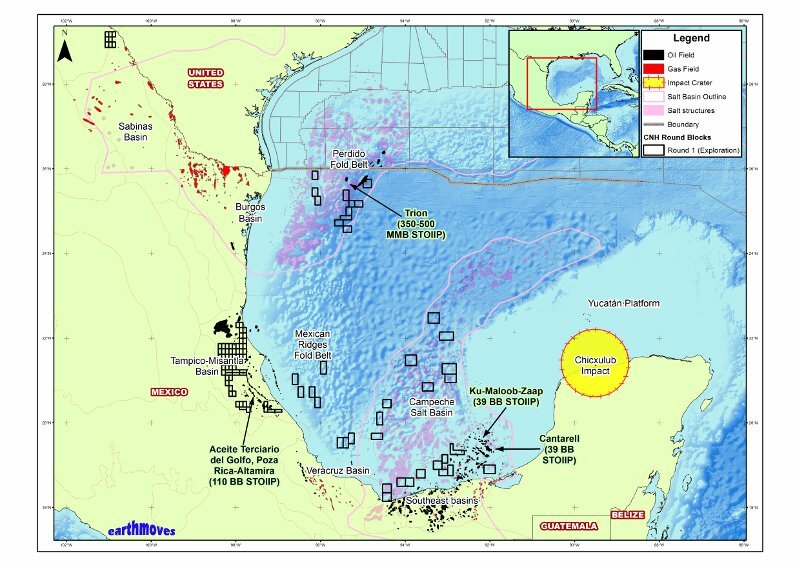 Only two wells have been drilled in the Campeche deepwaters so far, and the nine blocks on offer will be hotly contested. Unconventional shale oil and gas projects are just beginning in Mexico, and the onshore Tampico-Misantla and Sabinas Basins have a large number of attractive opportunities. Mexico’s most productive and largest fields lie in the South East Basin, owing their existence to the Chicxulub meteorite impact, which hit at 66 Ma. The bolide has been calculated to be approximately 10 km wide and produced a crater 170 km in diameter and 4 km deep. The impact caused a destabilisation of the carbonate platform edge and large thicknesses (> 300m) of carbonate breccias were redeposited in deeper waters followed by several rebounding tsunami deposits. Finally, an iridiumrich ash fall-out was deposited on top of the breccia which seals the Cantarell oil field (39 Bb STOIIP). This is a very complex area with allochthonous salt sheets and two phases of folding and thrusting, and many complex traps are present that have yet to be tested. Most of the prospective exploration blocks are already covered by 3D surveys, which will accelerate the exploration process and lead to exciting new discoveries in the coming years.